Being a teacher can be stressful and time-consuming! When I was in the classroom teaching 4th-graders through 12th-graders, I wanted to make every lesson important and effective. Doing something new was important to me because I bored easily, and my students did, too. I was not the type of teacher who could use the same lesson year after year or even period to period. Analysis and reflection are important parts of being an effective teacher. Sometimes our lessons are a huge success; other times, our lessons fall short or are complete failures in our eyes. As I completed lessons, I would reflect on what worked and what could be improved, and I applied what I learned as soon as possible. Why do teachers put so much pressure on themselves to have the perfect lesson on the first go round? The following shows the growth of an activity that was good in its first iteration and grew and improved with each iteration into an amazing, powerful, authentic activity. If you want to grow with the lesson, read on. If you are really only interested in the final project, jump to the third take. Either way, be confident that your lessons can grow and improve with each iteration. As you read along, pay close attention to how real-world involvement and application grow with each iteration. The teacher is Ms. Heyward. The class is English 4: British Literature, and students are mostly seniors with a few juniors sprinkled in. Paradise Lost by John Milton is the literary work of study. 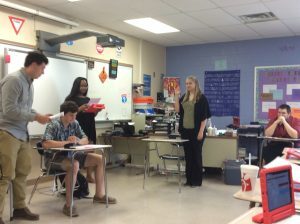 Students will participate in a mock trial to put the characters of Paradise Lost on trial. Students choose which group they want to belong to: 1) characters/actors in the live trial, 2) defense team, 3) prosecution team, and 4) news media. Each group is responsible for knowing his/her role whether it be developing a character from the story or becoming a lawyer or media blogger. The judge listens as the prosecution questions the witness, God. Eve is sworn in before being questioned regarding her involvement in the fall of man. The concept of a legal team was daunting because only one or two lead lawyers were needed. To include all members, each team developed a research team responsible for digging into the text and researching things on the spot. The presence of iPads made using a back channel as a collaboration tool possible; the back channel used was Today’s Meet. The research teams used it to feed questions and information from the story to their team’s lead lawyers to support the questioning and cross-examination of witnesses. Everything occurred in real time, on the spot. You either were prepared or you were not. There were no re-dos. Satan is cross-examined by an attorney. An attorney for the defense returns to his seat after questioning a witness. To include more students in the process, there were three media teams tasked with reporting and blogging in the style of three major news outlets: NPR, CNN, and Fox. Understanding political bias came into play with a review of powerful propaganda words. A Google Original site was created for each class (see them here: period 1 and period 3) documenting the project. 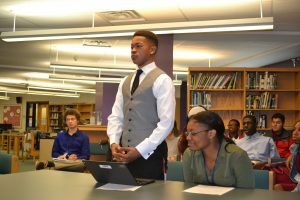 In preparing for the mock trial, students knew they had a responsibility to their team. 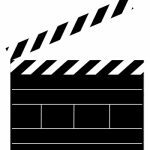 The actors had to know their storyline, the legal teams had to know the characters’ stories inside and out, and the media teams had to cover the events in the room while writing in the style of their specific news outlet. There was not a student in the class whose job did not matter. Engagement was high, and students left the room talking about the experience. The use of an authentic activity raised the level of engagement and understanding. A real judge presides over the authentic mock trial. Fast forward 2 more semesters. Ms. Heyward saw an opportunity for growth and improvement. 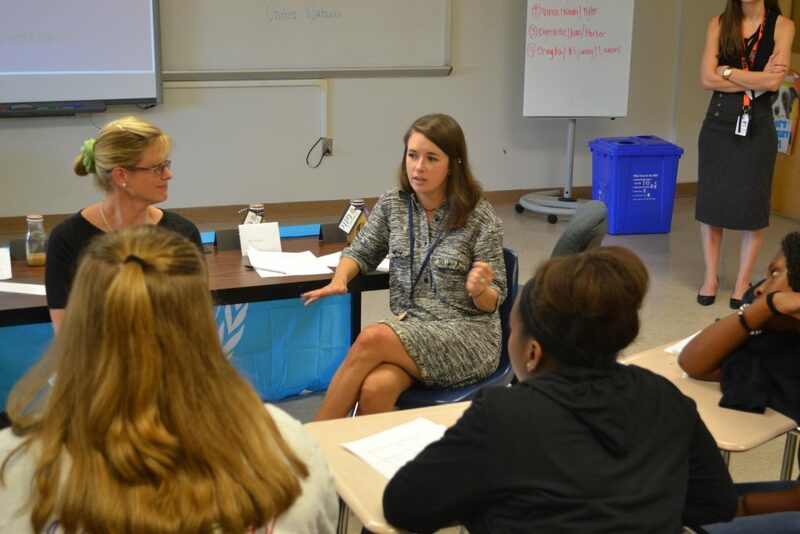 In an attempt to make the activity more authentic, she brought in real lawyers to train the students in actual trial proceedings and booked a journalist who recently covered a high-profile trial as a guest speaker to share her insights with the class. 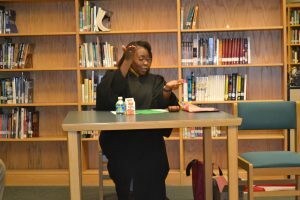 Ms. Heyward also booked a real judge to oversee the trial and had 12 adult jurors from the community serve, deliberate, and assign a verdict. There was much excitement as the trial date approached. Students worked on their teams to prepare. Witness statements were taken, pre-trial hearings were held to determine what will and will not be admissible in court. Arguments were developed. Media teams created their own mock news sites and started blogging. 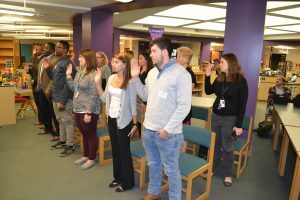 For this authentic mock trial, a 12-person community jury is sworn in. The prosecution worked collaboratively to prove guilt. Each attorney is trained in how to properly address a judge in court. This authentic activity has a bailiff to swear in each witness. Finally, the big day arrived. The Media Center was reserved, increasing the feeling of authenticity. A table at the front was reserved for the bailiff, judge, and witness box. The jury sat to the right of the judge with the Defense and Prosecution teams sitting opposite the judge and the news outlet teams behind them. It was very exciting. 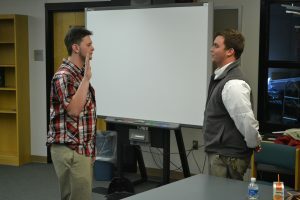 Witnesses were sworn in, attorneys stood to address the judge and question witnesses, jury members sat stone-like listening to the proceedings as Eve, Satan, God, the Son of God, and even Sin were called to the stand, sworn in, questioned, and cross-examined. Finally, it was time for the jury to deliberate. The 12-person jury deliberated in a private room to decide the fates of Satan and Eve. As one of the jurors, I can tell you we had a tough time agreeing upon a verdict. Assumptions were made and called out, outside information was brought up and disregarded. We had to focus only on what was said in the courtroom. Information we wanted had not been sought by attorneys, so we did not have the information we needed to find both defendants guilty. Upon returning to the courtroom, the jurors stated the verdict, and the judge took one guilty defendant into custody. Before wrapping up, the jurors were asked to share their experiences deliberating over the fates of two people. 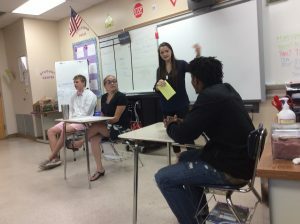 It was important that the students see and hear the points that jurors disagreed over, questioned, and finally voted on. Each student fully took ownership in his/her role. Students showed mastery of the themes of Paradise Lost. Students gleaned information about our justice system and the roles different people play within that system. Students collaborated well on teams working toward a common goal. 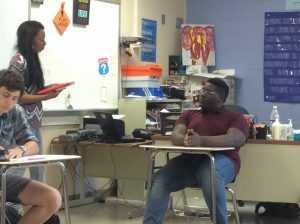 Some defense and prosecution members increased their creativity as they built arguments to defend or prosecute characters. Students thought critically about the parameters of our justice system and tried to manipulate it in their favor whenever possible. Students were not able to think quickly on the spot. Per the jury, the legal teams’ follow-up questions were weak or non-existent. Upon reflecting, strengths and weaknesses were identified. In general, the students clearly understood the text and its themes; however, their questioning skills were weak. We surmised that perhaps the final project was too much all at once. Perhaps the students needed more scaffolding along the way to prepare for the culminating project. Our new challenge: to find ways to incorporate similar types of activities throughout the entire curriculum. Upon returning from winter break, Ms. Heyward was excited to share with me that she had revamped her entire curriculum to address the issues making “Trial” the theme of her course using British Literature as the content covered. 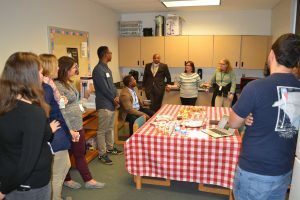 Each unit provided a guest speaker including lawyers from a local college and court reporters from the local CBS news station. Unit 6: Do We Have a Verdict? Full trial proceedings including all skills in units 1-5. The next class to experience the trial will have completed each step once in advance and will be compiling and returning to all of the lessons learned throughout the course: opening arguments, creating witness statements, collecting and analyzing evidence, building a defense, interviewing witnesses, creating follow-up questions, making objections, and addressing the judge. I’ll be back to share the details of the big trial. Just remember you, too, can develop a lesson like this. Don’t expect to do it all on the first try. Give yourself time and room to grow with the activity. If you take on too much too early you might be more likely to fail or get burned out. Good luck, and please share your ideas, comments, successes and failures here with the rest of us. If you would like to receive more stories like these to your inbox, please subscribe to our blog. Making English class relevant is not always easy. Knowing how to read, write, and communicate effectively are important life skills; however, this seems to escape teenagers. English class can be made relevant through authentic learning activities and authentic assessments. If you are looking for an authentic learning activity including Sharktank, a United Nations grant, a jury, and a solution to social issues, read on. 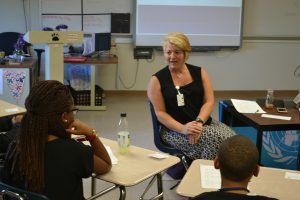 Mrs. Collier teaches block scheduled English I classes. This means that she has 3 classes a day for 90 minutes each. 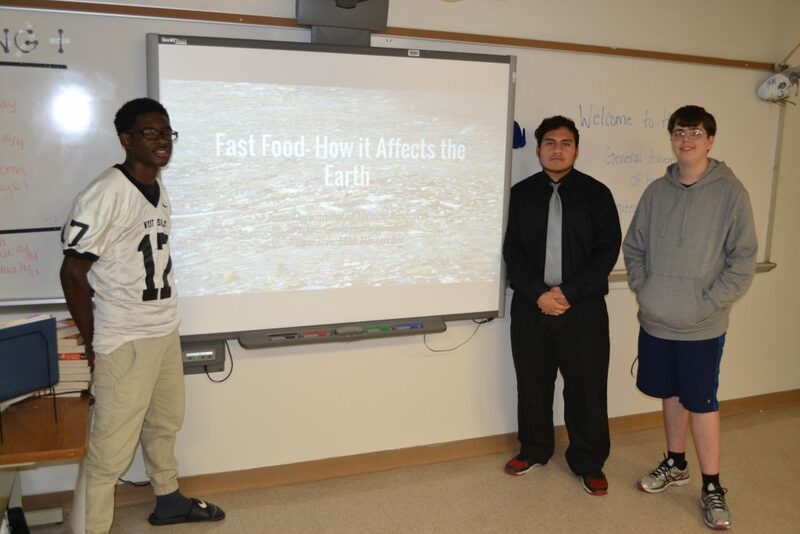 For a unit on the rhetorical triangle, Mrs. Collier decided to challenge her students with a problem-based scenario; her students were challenged to present to a panel from the United Nations offering a $4,000,000 grant to support the most innovative product to solve the social problem caused by fast food. Think Shark Tank here. 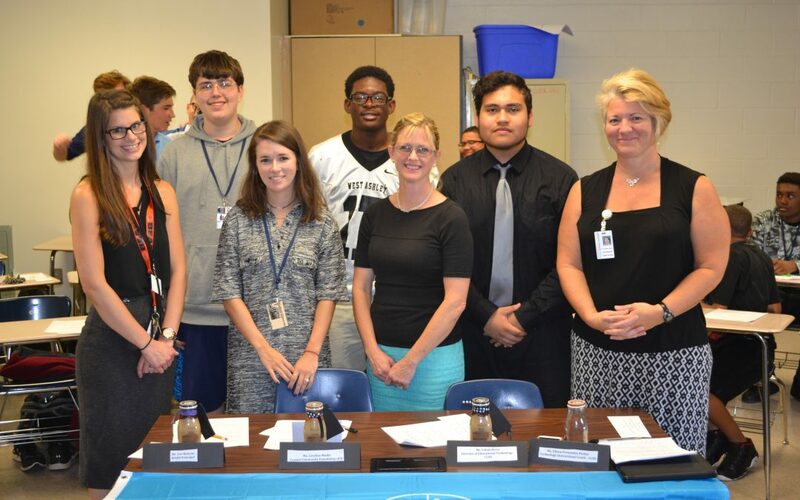 The students were expected to apply their knowledge of the rhetorical triangle and their skills of research, analysis of information, creative problem-solving, and presentation to convince the panel that their team and their product was the most viable and deserving of the $4 million grant. 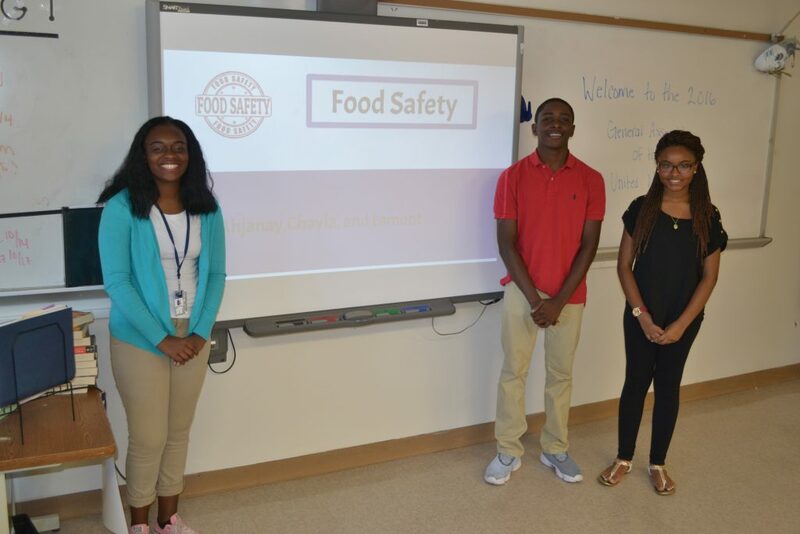 First, students collaborated in groups of three and were tasked to read one chapter in Fast Food Nation dealing with a specific social problem created by fast food. After reading the chapter, students had to research the social problem and come up with a Shark Tank-like product to solve the problem. 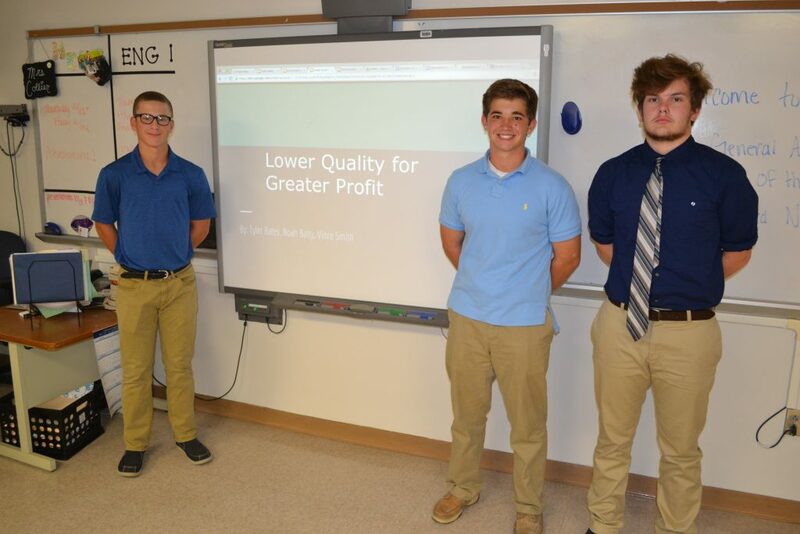 Next, the students had to create a presentation to try to convince the United Nations Grant Committee that their product most deserves the $4 million grant. 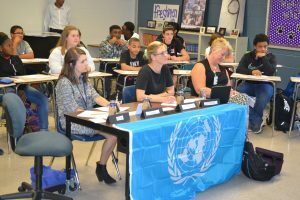 The students were tasked with applying the Rhetorical Triangle within their presentation to persuade the United Nations Grant Committee to choose their project idea as the most deserving of the $4 million grant. 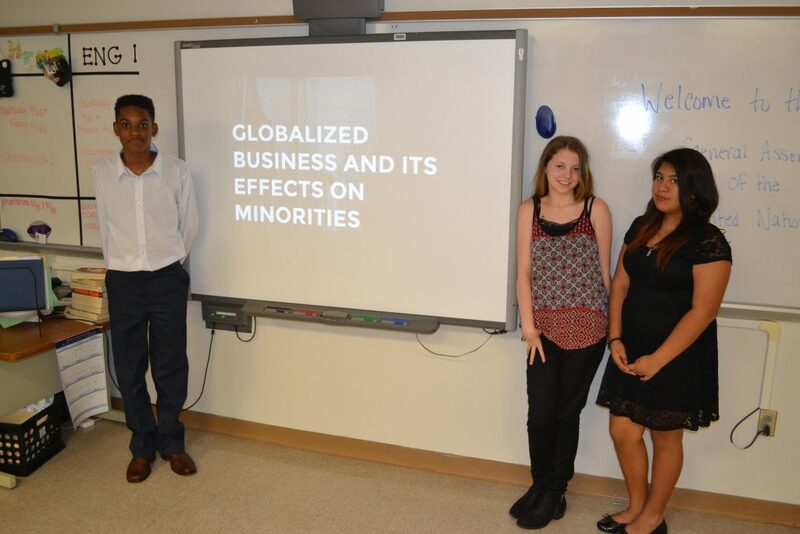 Having had training in applying logos, ethos, and pathos students were required to utilize all three in their presentations. community and district members to judge the presentations over two days. 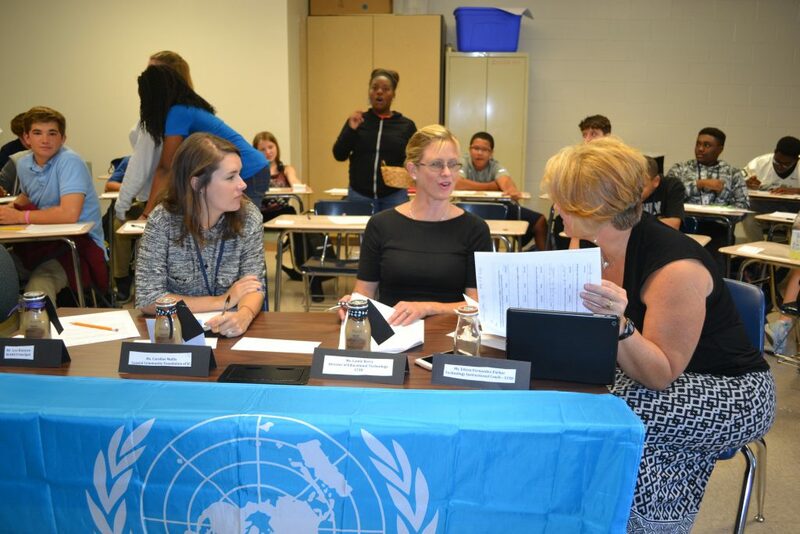 Along with Lainie Berry, the District Director of Innovation and Digital Learning; and Caroline Mullis, a representative of the Coast Community Foundation of SC; I had the honor and thrill of serving on the UN Grant Committee to judge 4 of the 8 projects. The 4 products included a citizen watch-dog project to monitor pollution, a government-led pollution-monitoring system, a machine that detects E.coli in fast food burger meat, and a biodegradable and edible food packaging. The Google Slides visual presentations were of varying quality as were the live student presentations. 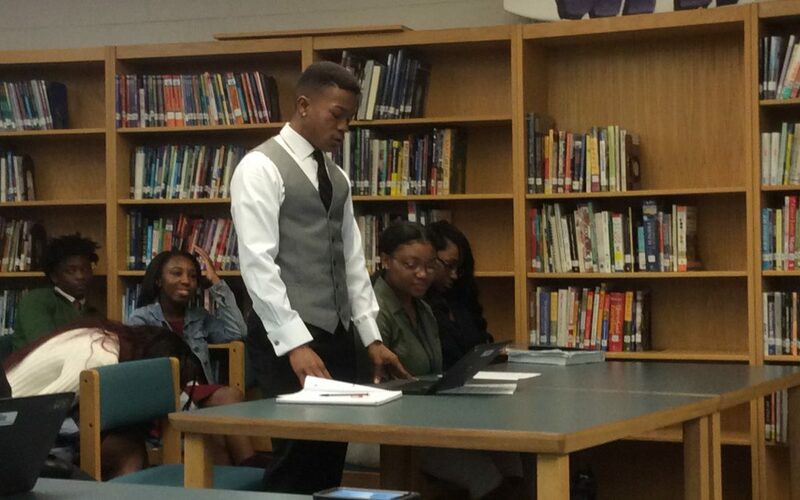 Overall, the 3-person jury was impressed with the level of research and creativity presented by each group. 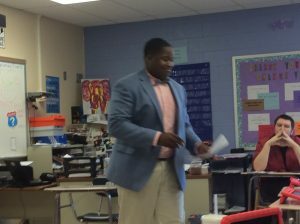 Mrs. Collier provided each jury member a rubric to judge the product, the presentation, and the rhetorical triangle and invited the jury members to ask questions for clarification before making our final decision. We three jury members discussed the strengths and weaknesses of each group, narrowed it down to two, and finally settled on one group to receive the grant. The winner was the biodegradable packaging to slow the pollution in the Arctic Circle. Finally, understanding the power of outside influence, Mrs. Collier invited the 3 jury members to give constructive feedback to the teams. This particular team was powerful because one member is a former high school English teacher, one deals with budgets and deciding longevity of a project, and the third deals with grant applications daily and knows what to look for. The feedback given to the students included standard points about body language, confidence, volume, diction, and eye contact. After that, the jury explained the strengths of each group’s idea. Finally, the jury explained how important it is to cover all of the research thoroughly, and that knowledge of the subject matter is what ultimately gave us the confidence to grant one group $4 million. This experience raised the level of engagement for the students because they had an authentic audience. 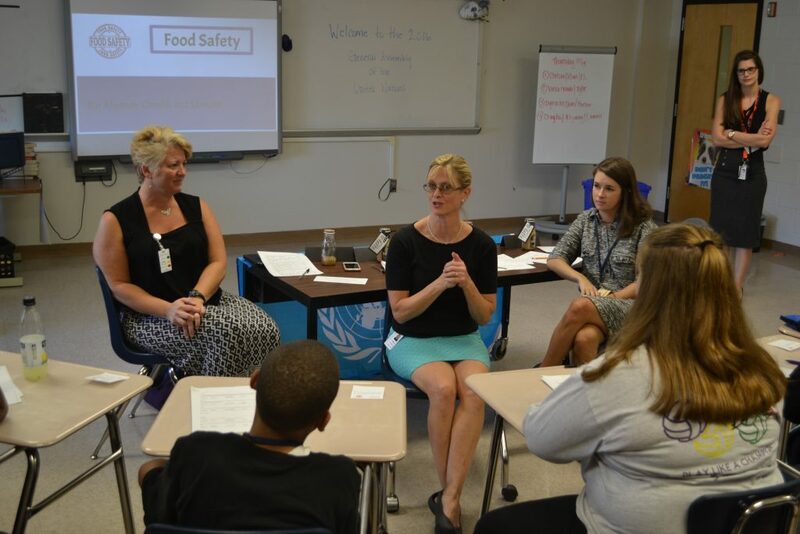 Mrs. Collier did a fantastic job creating a real-world scenario with a real-world issue. Kudos to her and her students for their hard work and dedication to learning. If you are interested in creating more authentic experiences for your students, I recommend heading to YouTube for a basic search. We found plenty of examples that served as an outline for what we wanted to do. If you have participated in authentic activities with your students, please leave a comment to start a discussion. I’d love to hear from you about how things went and what we can learn from one another’s experiences. Finally, if you enjoyed this post, please subscribe to receive more to your inbox. For differentiation in the ELA classroom, No Red Ink is a godsend. Although it has always been available via the noredink.com website, many teachers learned of it through Edmodo as an app. However, it is migrating completely to its website on June 30, 2016. See the company announcement below. As you may have heard, NoRedInk will no longer integrate with Edmodo starting June 30, 2016. On that date, we will transition your account to the NoRedInk website. Your data and classes will travel with you, and the site will look and behave just as it always has. The only change is that you will begin logging in at noredink.com rather than through an Edmodo app. On June 30, we will send instructions to this email address. 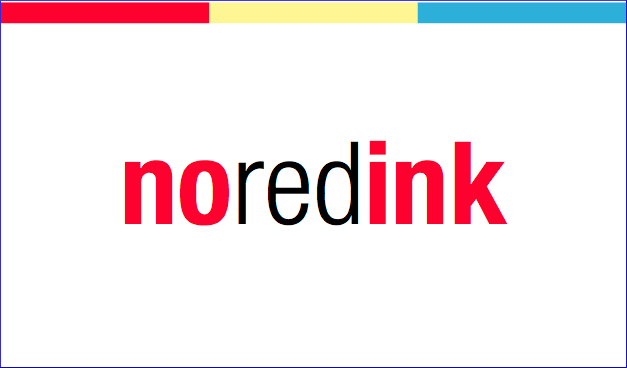 If you’d like to use a different address, please launch the NoRedInk app and go to your settings page. You can learn more about the change here. Also feel free to reach out with questions. If you haven’t already been using No Red Ink, now is the time to go to their website and set up an account. This app offers grammar practice with parts of speech, sentences, commas, parallel structure, MLA citations and more. This app could take you from 3rd grade through college. If diagramming sentences did not excite you, try No Red Ink on for size. It just might surprise you. As an English teacher, I saw my job as teaching people to think well and write well. The thinking was not nearly as difficult as the writing portion, and after leaving the classroom to coach teachers on how to effectively integrate technology into the classroom, I realize that writing was just a byproduct of what my real job was: to teach people how to communicate effectively. Writing was just one way to effectively communicate. With technology becoming ubiquitous in our personal, professional, and now educational lives, we have so many opportunities to communicate; learning how to communicate effectively is becoming more important than ever with the organization of ideas and the quality of speech and text being the main focus. If organization of ideas is one of the big three factors, why does written text take precedence over spoken word? Perhaps it has been that way because writing is permanent and digital writing is searchable. However, things have changed. Now, video is streaming live through Facebook and it is searchable on YouTube. Audio is also more prominent and is also searchable. While writing used to be more permanent, it is now just as temporary as audio and video because most of it is saved digitally. So then, why are we still focused on writing as the apex of communication? Organizing ideas for verbal communication such as a speech or a podcast is just as challenging as the written word save the grammatical hangups. 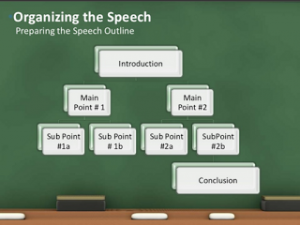 For our more verbal students, organizing thoughts for speech might even be a stepping stone to better writing because the student will process the information in a way that is his strength. Just as with scaffolding, this could scaffold for a hesitant writer. Check out this slidedeck by Professor Tamika Taylor with instructions for how to prepare for a speech. That’s where podcasting comes in. Podcasting is much like a radio broadcast. There are no images or written text. Everything is recorded in audio form. Some great examples can be found in iTunes and on StoryCorps.Org 1100+ of which have been shared on NPR.org. There are free audio apps available on all mobile devices from regular phones, to smartphones, to tablets. Apple or Android – it doesn’t matter. For Apple users, the Voice Record Pro App is free and powerful. Among the many features it offers, it allows you to import and export from Google Drive, offers editing, and saves into multiple formats. The age label is 4+ which means it is easy enough for kindergarteners to use. For Chromebook users, Vocaroo.com is a simple, web-based voice recorder that offers a simple record, pause, and stop dashboard. The recording is saved on Vocaroo’s servers for 2-3 months and then is deleted. It offers the user a link that can be copied and pasted to share with others. I love this app for simple checking for understanding especially for the younger children who can speak more easily than write. I have used this successfully with students as low as first grade. The world is changing, and the good news is that it now offers us many new ways to interact and assess our students. Check out podcasting for a new and different experience. How Is It Possible That AP Students Hate Learning?